The College of Creative Arts at Miami University hosted the #ThrivingArtists Network launch party on Thursday, September 13 at Castell Rooftop Lounge in New York City. 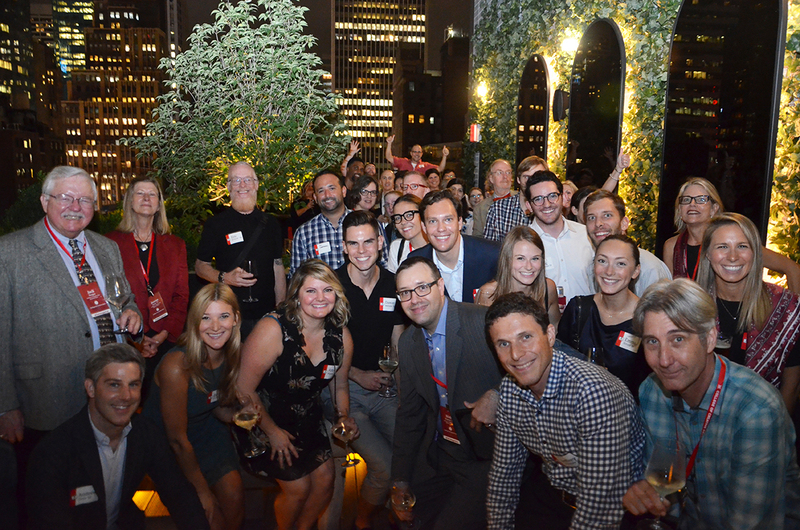 Nearly 70 creative alumni from New York mingled as the city provided a backdrop of glowing lights. The party took place on a rooftop space designed by College of Creative Arts alumni and current Advisory Board President, Dan Mazzarini,'03. The #ThrivingArtists Network was designed to connect enterprising alumni in major cities around the world with current and graduating students. The vision of the network is that alumni will help recently matriculated students moving to their city in a variety of possible ways: review a resume, allow for a job shadow, do an informational interview, or join the student for a meal. Creating this network will allow for both mentorships for recent graduates and collaborations between arts alumni in vital metropolitan areas. While in New York, the College of Creative Arts held an advisory board meeting in the boardroom at the Museum of Modern Art. The advisory board is comprised almost entirely of high achieving alumni working in creative industries, with nearly half residing in New York. Please visit the College of Creative Arts facebook page to see the full album of photographs from the weekend. Go to Miami Alumni Connect to Join the #ThrivingArtists Network!